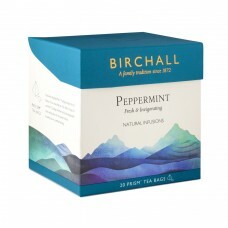 Birchall Peppermint is a classic herbal tea made from only the finest pure peppermint leaves. Peppermint is traditionally acknowledged to aid digestion and our luxurious single mint infusion is entirely caffeine free, making it perfect as an after-dinner digestif or as a late evening refreshment. Our pursuit of quality ensures we have only picked whole peppermint leaves for this blend and it is these that give Birchall Peppermint its deep amber infusion, vibrant, awakening aroma and cool, minty taste.